These blue realistic flames were airbrushed the exact same way as the toxic green realistic flames on the white sand dune buggy body in the Airbrushing Realistic Flames DVD. On this white Honda custom paint job I used Xotic Colours urethane airbrush paints. I used Chinese Blue candy (the light blue) is the main and first color put down first layer of realistic flames and then highlighted them with a darker blue, Royal Blue candy airbrush paint. 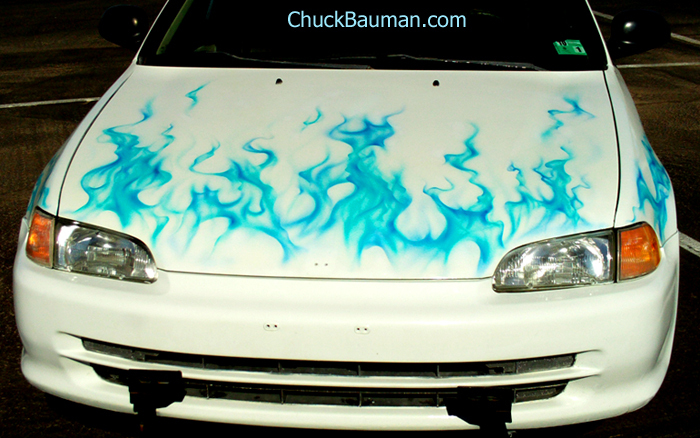 This is a view of the hood of the white Honda Civic car airbrushed with the Cool Blue Fire - blue realistic flames. This view shows the blue realistic flames airbrushing custom paint job from in a 3/4 view of the Honda Civic from the front right -- passenger's side. This view shows the blue fire airbrushing on the Honda Civic straight on from the driver's side. AIRBRUSHES - CHEAP AND GOOD QUALITY AIRBRUSHES!